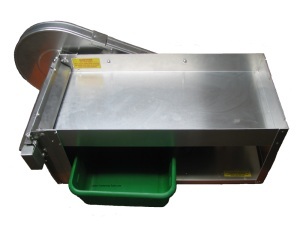 The Taylor Pea Sheller (Model 675)) is the longest lasting and most trusted pea sheller on the market. Made in America, easily shell 3-4 bushels per hour with its 1/3 horsepower motor. The easily adjustable rollers are made from high tensile materials and can accommodate a large variety of peas and beans to fit any hulling needs. Weighing in at 35 pounds, 27.5" W x 16.5" L x 14" H. Backed by over 50 years of experience, this high quality pea sheller machine will serve you and your family for generations to come! It is the perfect sheller for small commercial farms. The Taylor 'Lil' Sheller is a high-productivity machine, pumping out around 3 or 4 bushels per hour. Because the hopper is flat instead of the slanted, you can put up to 1/3 a bushel on the hopper as the beans are fed into the machine. This speeds up your productivity because you're not constantly having to refill the hopper by the handful. The 1/3 horsepower, 115-volt, 60Hz Dayton electric motor is powerful enough to handle the biggest loads all season long-year after year. The machine can be plugged into your standard 110-watt power source. Equipped with scientifically designed rollers that adjust to accommodate peas and beans of different sizes. Made of high tensile neoprene, the spiraled ridges on the rollers prevent peas from getting caught in the roller. The rollers' unique design causes them to turn at the precise speed needed to hull the perfect pea. Not too slow and not too fast, the rollers won't let your peas be smushed! They are designed to push the peas out from back to front so that the hull splits perfectly and your peas stay free from bruises. Front and back roller guards and a belt guard ensure your bean shelling experience is trouble free. 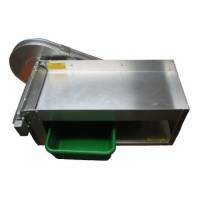 The on/off switch allows you to easily turn off the sheller without having to reach down to unplug it. This is a once in a lifetime purchase. We have machines that are more than 40 years only in regular use today. It is durable, long-lasting and will serve you for years to come. The Taylor brand is well-respected and has 50 years of innovation and experience behind it. Replacement parts are available, if needed. People tell me the reason they don't plant butter beans is because they are difficult to shell. Can't argue that! The Taylor 675 is an excellent butter bean sheller machine as well as a lima bean sheller. What Are Your Pea Sheller Plans? People inevitably wait until they are hand shelling before they call me to get one. We buy as many as we can before the season begins, but are often times wiped out. The earlier you make plans to purchase a pea shelling machine, the better. Yes, this does a fine job as a dry bean sheller. We've tested it out and are quite pleased with the results. We are the only online stocking dealer. We are the only dealer that carries the entire line of Taylor parts for the 675 & 665 models. We have long hours of operation. Everyone else is M-F 9-5. You need help when you're shelling. Expert advice. We've been factory trained on the finer points operation. We actually use the shellers we sell on our own gardens.